There are hundreds of Jewish holidays. Okay there are twelve, but that’s actually so many! We have a holiday to celebrate the birthday of the trees! Sukkot celebrates agriculture and autumn and the harvest season. It involves building and sleeping in a sukkah, which has three walls and an roof made of tree branches or bamboo to allow the stars to shine through. This pumpkin cheesecake screams October. It has pumpkin, but not too much. Its almond gingersnap crust takes .0409 seconds to prepare and works so much better than a boring old flour/butter pie crust would. It’s fall! It’s Sukkot! There’s a fjord in our pie but we don’t care! For the crust, toast the almonds in a 325º oven for 12-15 minutes, or until fragrant. Chop coarsely. Place a generous 1/2 cup of the almonds into a food processor with the sugar. Process until very finely chopped. Pour into a large bowl and add gingersnap crumbs and butter; stir well. Press into the bottom and sides of a 10″ pie plate. Bake for 10 minutes (at 325º), then let cool. For the filling, beat the cream cheese and brown sugar in a large bowl with the orange zest. Beat in the sour cream and eggs, one at a time, until the mixture is light and fluffy. 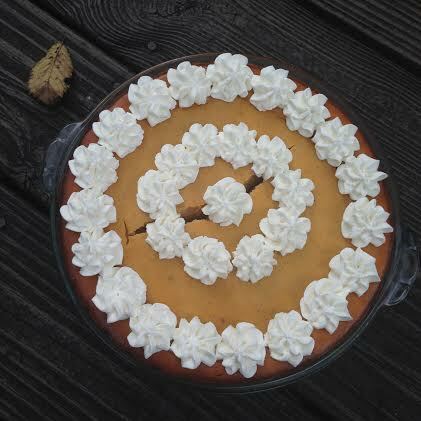 Beat in the pumpkin and pumpkin pie spice, then pour the mixture into prepared pie crust. Bake for 45 minutes or until the filling is set. Let cool on a rack, then cover and refrigerate overnight. The next day, beat the heavy cream with sugar until stiff peaks form. Pipe rosettes (I used a close star tip) in concentric circles on the cheesecake. Note: I don’t mind cheesecake having a few cracks, but if you’d like, Diana has some good tips on crack prevention.